At the turn of the twenty-first century, recorded music, largely already converted into digital formats, began to migrate – like all entities in the social world – into the Web. This symposium aims to study these transformations from three points of view. Although they can often be, and often are, intertwined in reality, we propose to consider them separately: the dimension of production (how digital technology and the web have transformed production, and the dissemination of works and performances? ), the dimension of reception (how digital technology and the web transformed our way of experiencing music or, more precisely, of perceiving, appreciating, and judging it?) 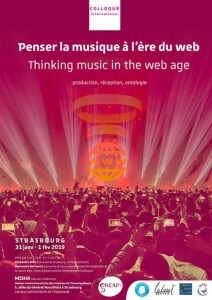 and the dimension ofontology(how digital technology and the web transformed the being of traditional musical entities and which new entities have they made possible? ).